1 of 1 In a food processor, combine flour, cornmeal, sugar and salt. Pulse to blend. Cut up butter; add to processor. Pulse until incorporated. Add egg and 1/2 cup water; pulse until dough begins to hold together. Gather dough into a disk; refrigerate at least 1 hour. 1 of 3 Coat a large nonstick pot with nonstick cooking spray. Heat over medium heat, and add onion, green pepper, garlic and chile powder. Cook 5 minutes. Add zucchini and jalapeno; cook another 3 minutes, adding a little water if too dry. Stir in chicken, breaking apart with a spoon. Cook 6 minutes, until chicken is no longer pink. Stir in tomato paste, chocolate, sugar and salt. Cook 3 minutes to blend flavors. Remove from heat and stir in lime juice. Let cool. 2 of 3 Heat oven to 400 degrees F. Divide dough into 12 equal pieces. Roll one piece into a 6-inch circle. Repeat with remaining dough, for a total of 12 circles. Transfer dough circles to two nonstick baking sheets. Place 1/3 cup filling on one half of a dough round, then brush edge with water. Fold over to enclose filling. Press edge together, then crimp with a fork. Repeat with all dough rounds and filling. 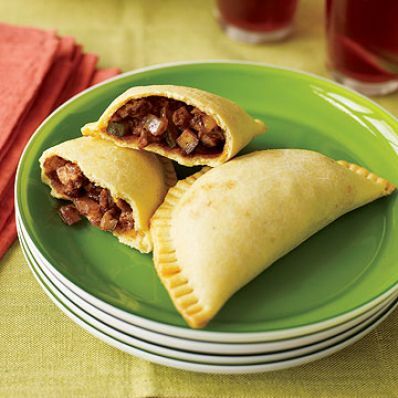 Brush empanadas with egg-water mixture. 3 of 3 Bake at 400 degrees F for 18 minutes or until light brown around edges. Transfer to a platter. Serve warm. 1 of 1 You can assemble and freeze these before baking. When ready to bake, do not thaw; transfer still frozen to baking sheet and increase baking time to 25 minutes.